Help House has began its fundraiser for the food pantry, a quilt raffle that runs from now to Dec. 17, 2016. 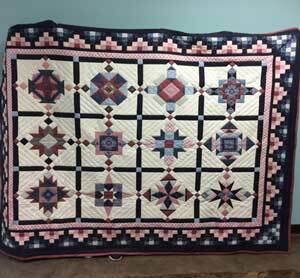 The king size quilt was made by Vicky Lawrence, of Overbrook. The quilt has hand pieced blocks, and was border pieced by machine. The entire quilt is hand quilted, made of 100 percent cotton with polyester batting. Minimum value is $1,500. Tickets are available at Help House, or call 785-828-4888 for more information or to have a volunteer from your area contact you to purchase tickets: one ticket for $5 or 3 for $10. The drawing will be held at noon on Dec. 17 at Help House. To help reduce hunger, more than 200 Osage County households receive supplemental food from Help House each month. For more information, contact Help House at 785-828-4888, [email protected], www.osagecountyhh.com, like Help House on Facebook at Osage County Help House, or stop by at 131 W. 15th St., Lyndon.